As a Lifestyle Blogger I get the opportunity to test out a lot of different products, let's face it, it's a tough job, but somebody's got to do it! While I don't mind it being me, I do know that in between products I take a few days and go back to old favorites whether it's skincare or hair-care. My first 'salon' hair product was Nexxus, that is what my hairdresser at my favorite hair salon used on me during each visit so that is what I would buy to use at home as well. When I'm not testing new products this is still the brand I tend to return to so when I find ways to nab it a discount I definitely take advantage. Turns out my old favorite has actually been re-formulated, and now offers a new Encapsulate Serum that has been enriched with 100% Elastin Protein and Caviar Complex to help re-balance, restore and replenish hair, I don't know about you, but Spring always puts a new bounce in my step, why not put some bounce in my hair too? Feeding my hair Caviar? So FANCY! 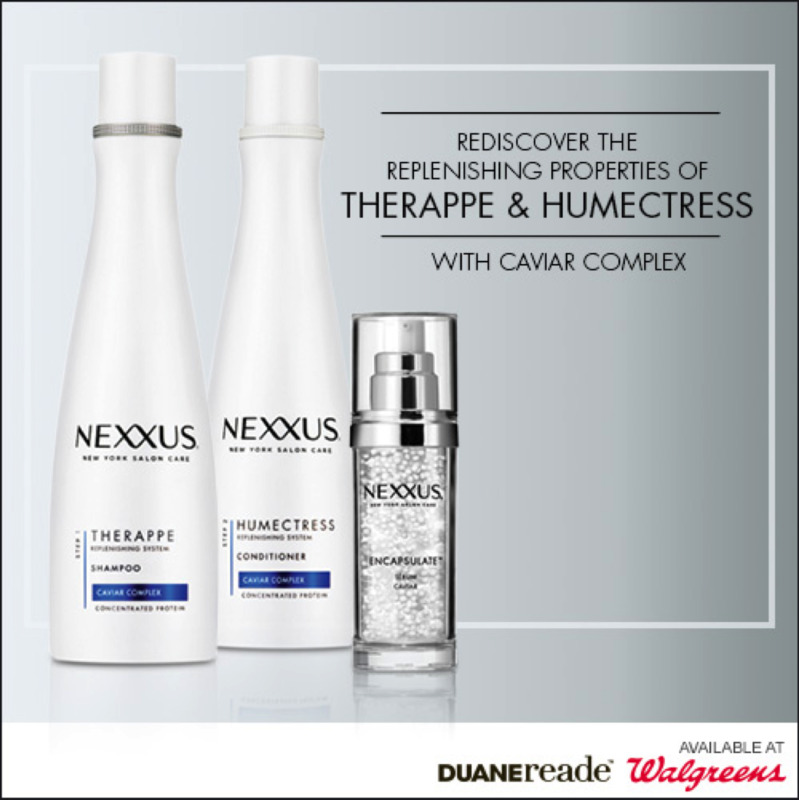 I stayed with my favorite hairdresser until he retired from the industry and the smell of Nexxus will always remind me of him, I am looking forward to trying out the newly re-formulated Therappe Shampoo, Humectress Conditioner and the Encapsulate Serum, I say just like we re-vamp our makeup routines come Spring, we should mix things up with our hair too! What is YOUR Favorite Haircare Brand? I used to use Nexxus before I started getting keratin treatments in my hair. Now I have to use a special protein shampoo and conditioner to make the keratin last longer. My GF loves Nexxus. I just wash my hair with whatever I happen to pick up! =D I'm definitely letting her know about the Twitter party. Thanks! I want to be at this Twitter party. I am marking the date and hopefully will be around for it. Nexxus, hands down, is my favorite hair care scent. I remember getting to use it as my mom's "special shampoo" as a kid and it has stuck with me. I would be interested in trying the new formula also. Sounds great. Oh I'm looking forward to this party! Love Nexus products! I didn't know this was available yet. I need to come to the twitter party and find out more. Nexxus was my first salon shampoo/conditioner too! I've used Nexxus, for some reason I haven't bought it for sometime ,Great to have the coupon i'd love to try the new re-formulated version Thanks I'll check out the twitter party . 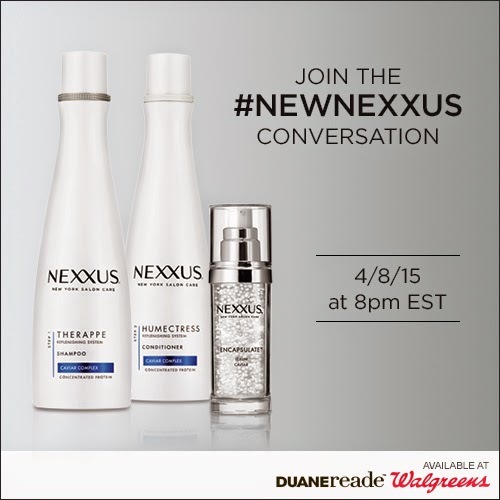 Ohhhhh totally want to attend this, Nexxus is one of my favorite hair brands! I actually used this EXACT conditioner for years! My mom always used this brand! I think she will be pleased to hear they have re-formulated it so she can try it again! I'm looking for some new products for the spring, I will check these out! $2 off is a good deal. I like Nexxus products here too. Nexxus is one of my all time favorite brands. I'll definitely check out the twitter party. I dont think Nexxus would work on my hair but I heard it was a great product for other textures! This will probably be a good twitter party too! I've never used Nexxus before. I'm not sure I've ever heard of it really. I will have to check out the twitter party! I've heard so many good things about Nexxus. A $2 off coupon is the perfect reason to try out their products! Nexxus is a great product line. I will have to use the coupon and get a bottle. I love how soft my hair is when i use it. Nexus Humectress was my favorite for the longest time. I still have so many memories of that great smell. It's been many years since I have used it. I have noticed it popping up in more and more stores lately. I have honestly never tried Nexxus, but after reading your post and the comments it seems to be a must try product. I'll have to check the twitter party out too! I have seen and heard of this brand but haven't used it before. I might jut have to give it a try.